Don't forget to add Lucky Laps to your calendar March 14th! ¡No olvide añadir Lucky Laps a nuestro calendario el 14 de marzo! Mr. Buller, principal of West Grand Elementary and Middle School, has challenged the entire student body to collectively read 1,000,000 minutes by the end of the school year. If successful, each student will receive one strip of duct tape that they will use to adhere their principal to the wall. The competition officially started Tuesday, September 4, and will conclude on Wednesday, May 22. *Each homeroom teacher will collect minutes each month from students and post them on the display in the front of the building. *Only reading conducted outside of the school day and in addition to assigned reading will count. *Students who read to an adult may count that time. It will take the participation and encouragement from EVERYONE to complete this challenge, but IT CAN BE DONE. Happy reading, everyone! WELCOME TO THE NEW WEST GRAND MIDDLE SCHOOL PAGE! Welcome to our new page! Take a look around. We are still under construction and content and layout may change as we finish adding continue to add content. 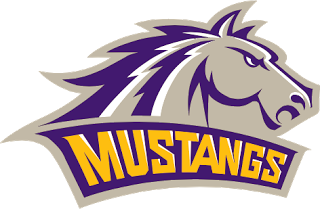 The administration and staffulty at West Grand School District are excited to announce that we are at the point where we can provide you with access to your student's current grades, attendance, lunch and fee balance via the internet. To access this information you will need to have a parent portal account via PowerSchool. If you do not already have one, please email or call Taryn Edson for assistance in setting up this account. You may contact her by email at edsont@wgsd.us or phone at 970-724-1061. You may access this account in 2 ways. You may log on from any web browser using the following address: https://wgsd.powerschool.com/public/home.html or you may download the PowerSchool Mobile app from your cellular provider's app store. If downloading the mobile app, our district code is PDQG. However, you will still need to set up a username and password. Please see the attached information regarding West Grand Robotics First Lego League Kickoff Event! 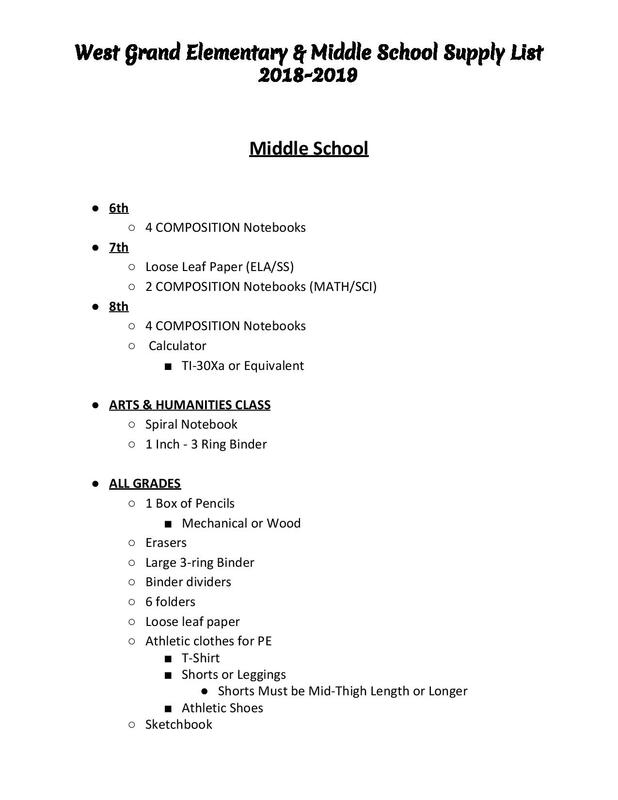 This is for anyone in grades 4-8. 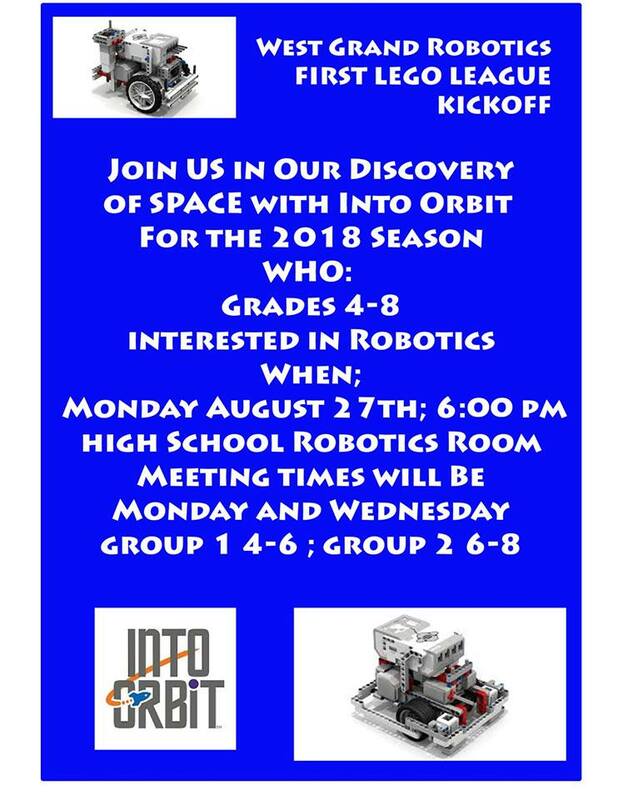 Kickoff is Monday, August 27th at 6PM at the High School Robotics room. Please keep in mind these important upcoming dates. West Grand High School will host a back to school rally on Wednesday, August 22 at 6:30pm. This is a combination of back to school night, all athletic meeting, and Booster Club Kick-off. All are invited including WGHS students, parents, and community members! 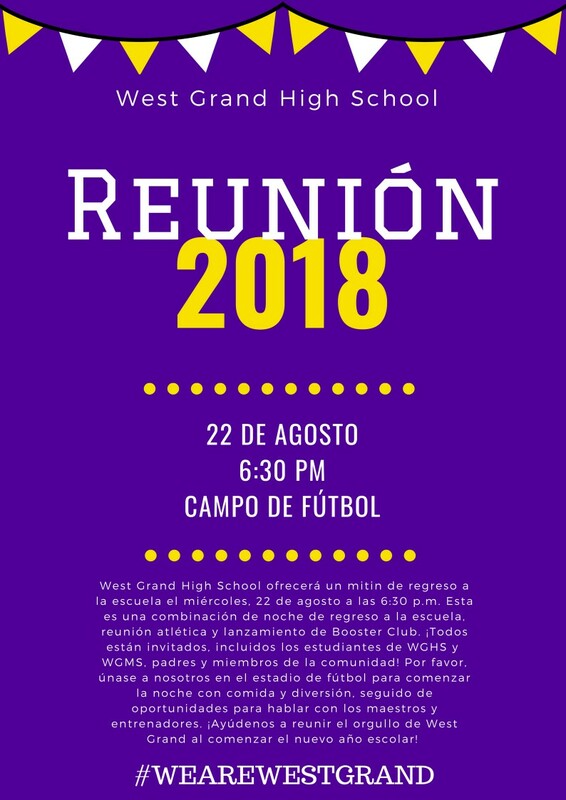 Please join us at the football stadium to begin the evening with food and fun to be followed by opportunities to speak to teachers and coaches. 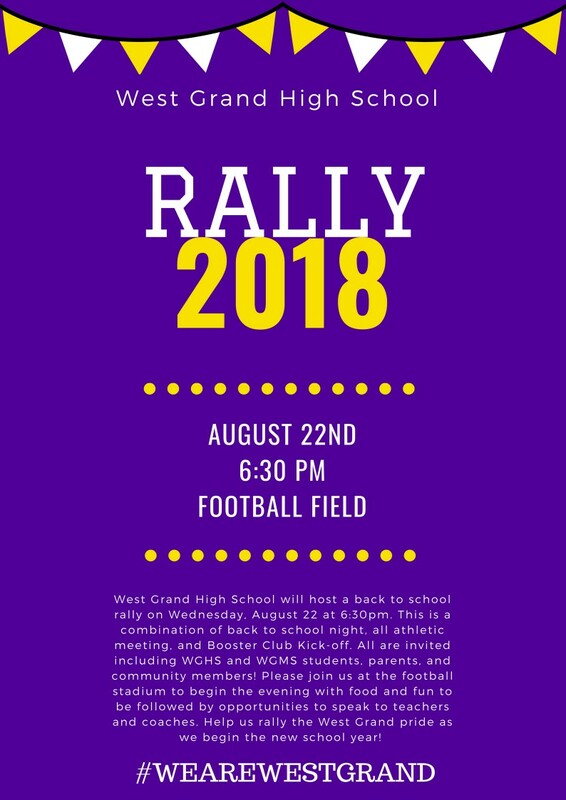 Help us rally the West Grand pride as we begin the new school year!" 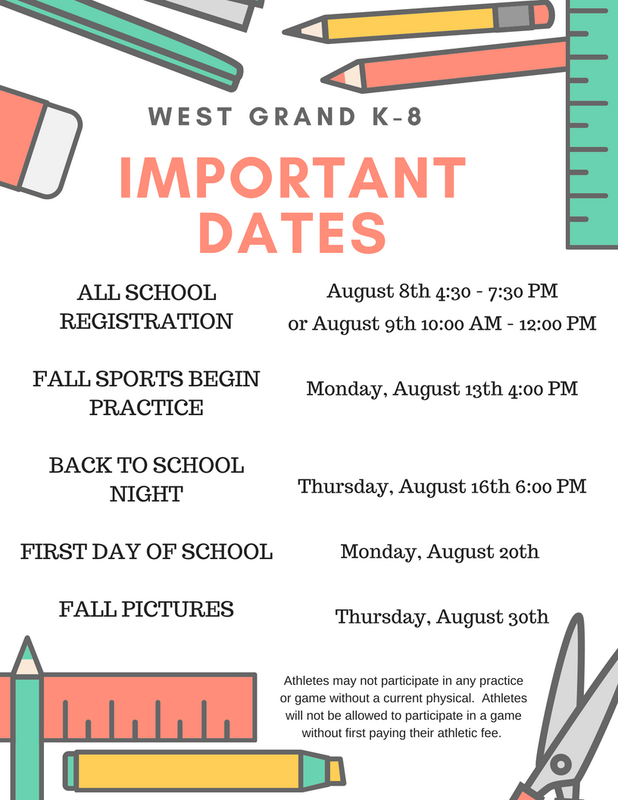 All school registration is Wednesday, August 8th from 4:30 to 7:30 pm and Thursday, August 9th from 10:00 AM to 12:00 PM at the K 8 Building. 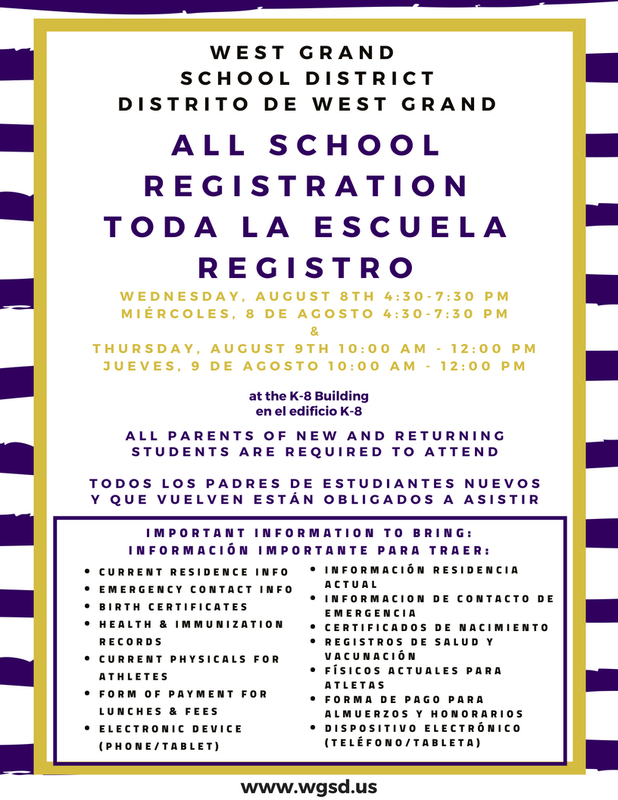 All West Grand students grades kindergarten to 12 are required to be registered.